It seems like yesterday, we were hauling our canoes to the various pools and looking forward to a new season. The summer passes so quickly, I guess because we are all so busy seven days week for almost five months straight, we dont see the time pass. Jim Thomas with his first Bonaventure Salmon, congratulations Jim, well done! We are fortunate to have had another great season despite the driest and warmest summer on record. Water levels on the Bonaventure Petite Cascapedia and Grand Cascapedia reached all time lows. Despite all of this water temperatures remained cool considering the weather. 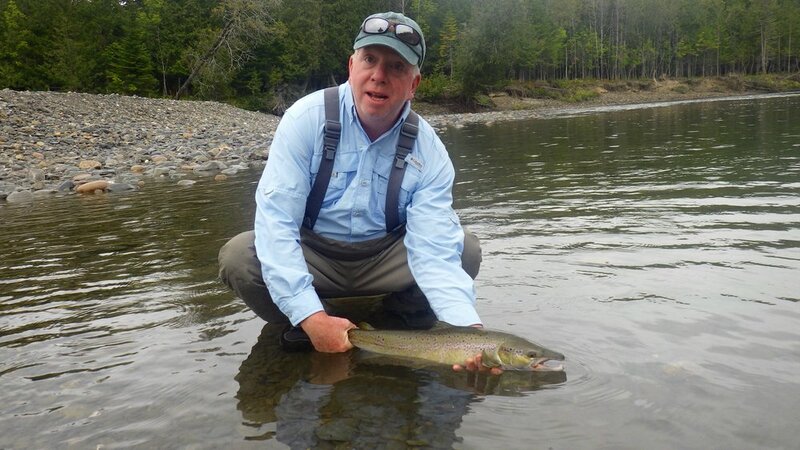 Michael Norris landed this beautiful fall run salmon on the Bonaventure, nice one Michael congratulations ! 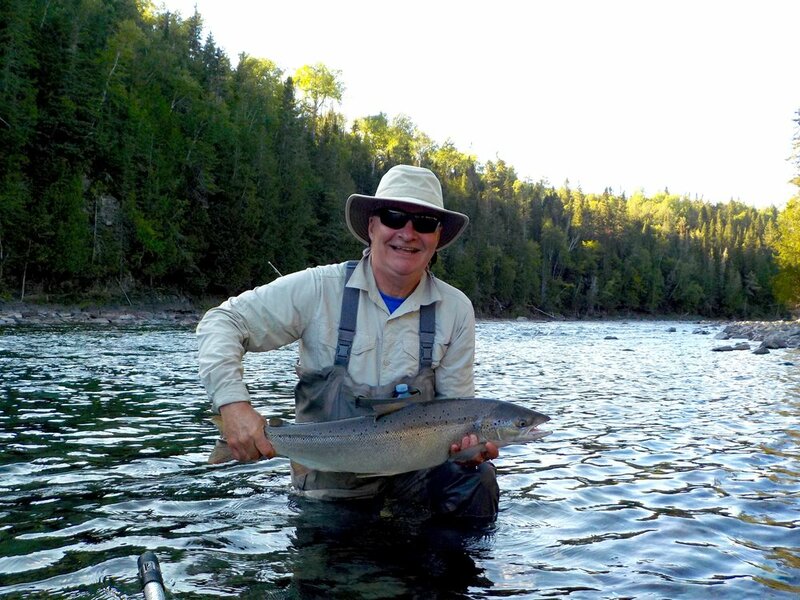 The fish counts on the Bonaventure in mid July and again in mid September showed good numbers of salmon in the river. By mid July the Bonaventure had surpassed its spawning requirements. The same story on the Grand Cascapedia where we had good numbers of fish by mid season and again in September. The Petite Cascapedia completes their fish count in October however our guides reported seeing a good number in the Petite this year. 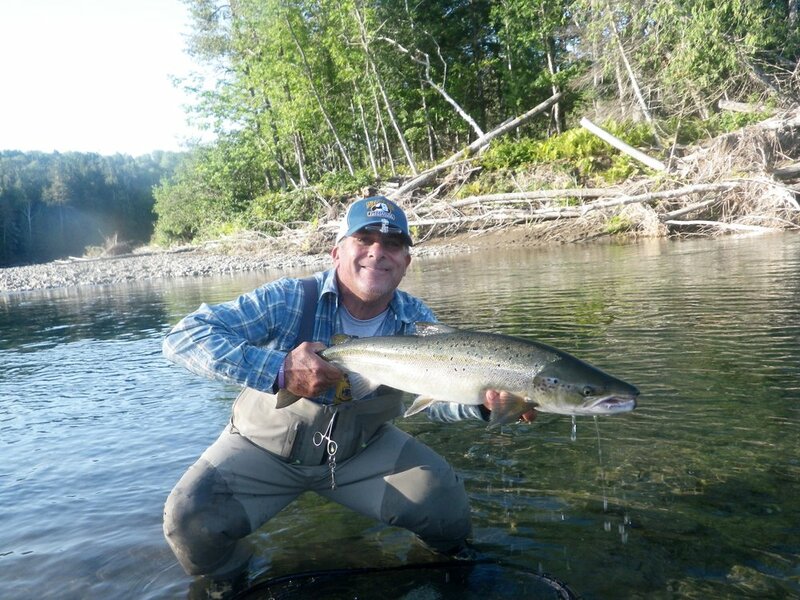 The fall run is running late this year due to low water but there are plenty of salmon still waiting to come in, not so great for anglers but certainly good for the river. Joseph Keivett has been coming to Camp Bonaventure for a number of years, He’ really catching on how things are done! nice one Joseph! I must commend all our guides on a job well done. This year was particularly tough due to difficult conditions, more specifically hot weather and low water. Day in and day out they came to work with a smile and gave our guests a memorable day on the river. Fishing was tougher this season but we did have plenty of salmon in our pools and plenty of opportunities . Granted the challenge our guides managed to get our clients into fish almost every day. Great Job Guys! Jim Fowler with his first salmon of the season, nice one Jim! Its now October and most of the guides at Salmon Lodge, Camp Bonaventure and the Club are out in search of Moose and Deer. Yours truly will be out there with them enjoying the great outdoors. 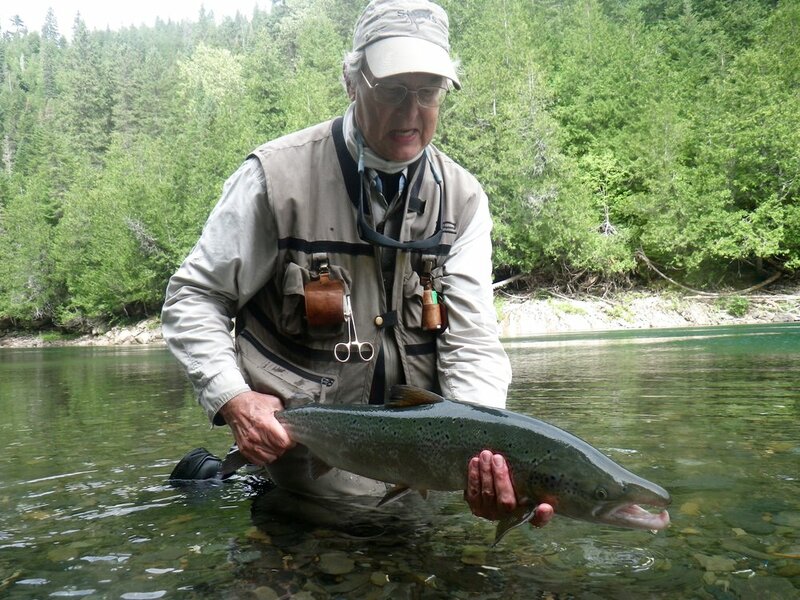 Douglas Andrews landed this fine salmon on the Bonaventure, congratulations Doug ,well done ! As we look towards the fall and winter its nice to remember all the good times we have each season. Seeing all our repeat guests each year makes what we do very special. The relationships we formed over the years are very special to me, the staff and guides. I wish all of you that have spent time with us a very pleasant fall and winter. Thank you for your loyalty to Camp Bonaventure ,Salmon Lodge and the Club. Its because of you , we get to do what we love! A special late season dry fly. We look forward to seeing you again next season. Keep checking in from time to time over the off season. I will be posting and keeping you up to date with any news and events. Another season has come to an end, until next year! Glenn & The Staff & Guides at our three lodges. September is my favorite time of the season, water temperatures are perfect and we always receive just the right amount of rain the keep our rivers at perfect shape. Some years rain comes in August while others in September. 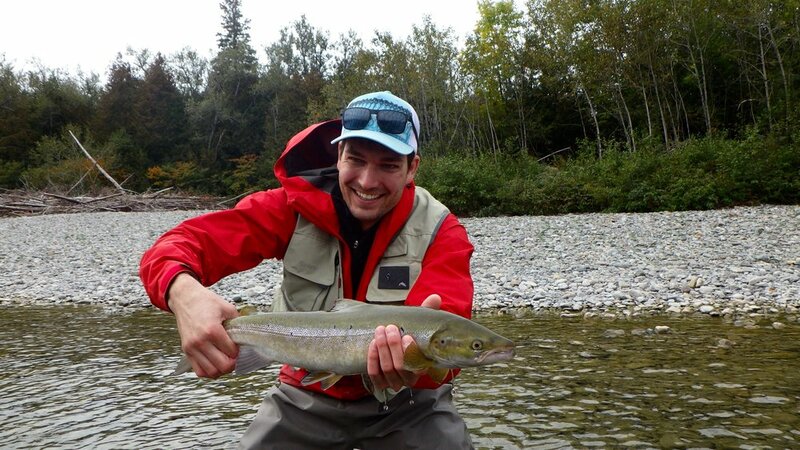 Camp Bonaventure regular Stephane Lavoie with his first one of the season, Congratulations Stephane. 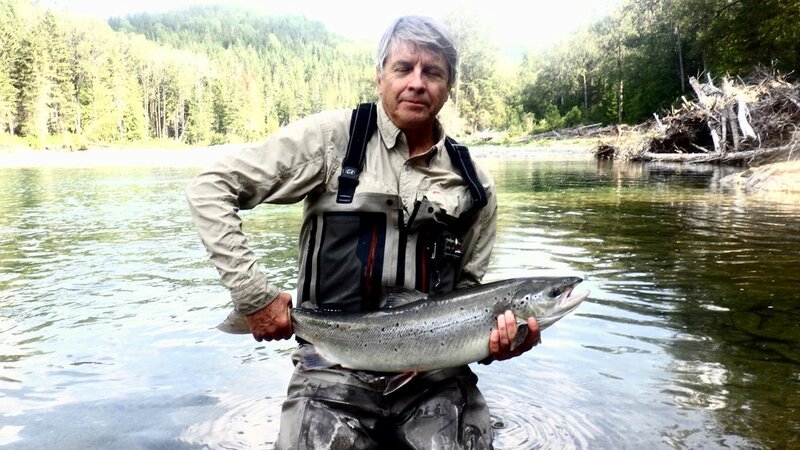 John Allman with a fine Bonaventure salmon, well done John! This year more than ever we needed rain, I’ve been around these rivers for almost 40 years and have never seem them so low. To be honest, this year I was wondering if rain would come at all. Thanks to Hurricane Florence we finally got the rain we needed. I’m not running out to by a bottle of 18 year old to celebrate, but just happy to get some new water. Michael McMinamin leads our annual Irish group each year, a great bunch of guys and superb anglers, Nice one Mike. The was Stephan Flanagan’s first trip to Camp Bonaventure, not his last! nice one Stephan! Tony Black is a Scottish salmon fishing gillie, now he knows how to catch them on both side of the pond Congratulations Tony! Our rivers are in the best condition since July, The Grand Cascapedia is fishing well and flowing at 10 cubic meters per second. The Petite Cascapedia is also in better shape and flowing at 6 cubic meters, up from 4 . 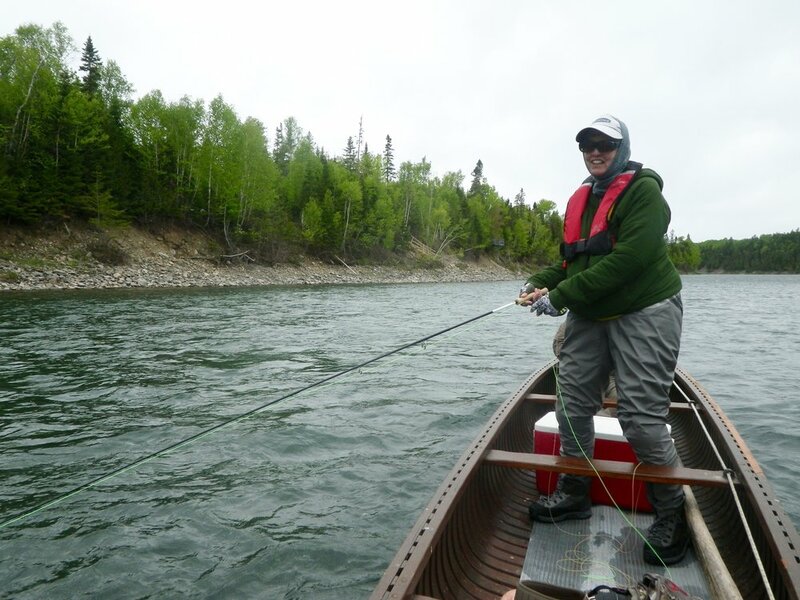 The Bonaventure is fishing better and conditions are good, water flow on the Bony is at 7 Cubic meters and the temperatures are in the 50 degree range, not bad considering all the hot weather we had. Camp Bonaventure friend and long time guests Chris Williams, A good one Chris, Congratulations! Sharon Dombrowski is a regular September visitor to the lodge, she’s a great lady and angler, well done Sharon, see you next year! Orvis fishing travel expert, Dan Davala with his first one of the season, nice one Dan, congratulations ! The fall run has been coming in slowly, but with this latest bump in water, things should turn on. Higher and cooler water volume combined with high tides should translate to happy anglers next week. 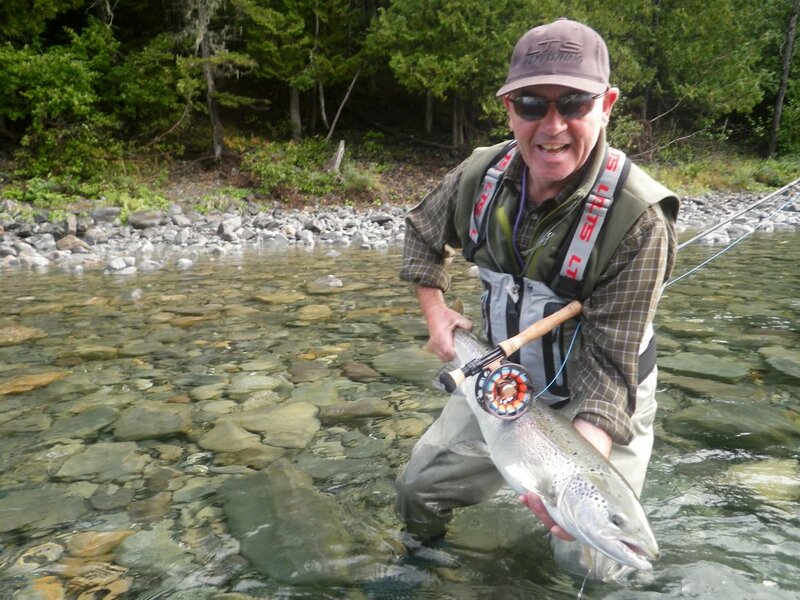 Chet Warner with his first Atlantic Salmon, Congratulations Chet! may it be the first of many more to come. September fly choices are different from any other time of the season. The Red Francis is always the fly of choice as well as the Alley Shrimp and GP . Sun Ray Tubes also work well in September. As long as our water temperatures stay in the 50 degree range, dry fly's will continue to produce. As always the Green, Brown and Blue bombers will get the job done. The weather man was kind to us this past week giving us the rain we needed. We received a good rain fall on Tuesday and Wednesday giving our rivers a much needed boost. After being exceptionally low for most of the season our water conditions were much better this week. 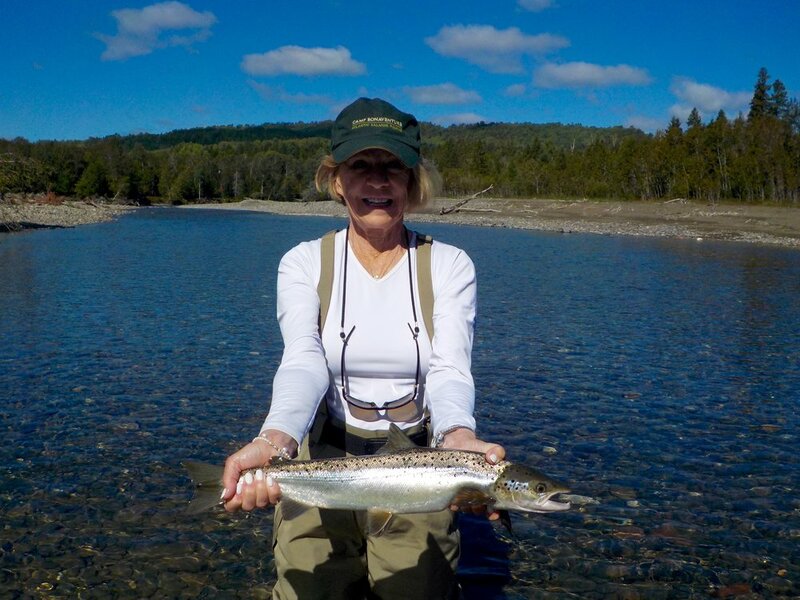 Congratulations to long time Camp Bonaventure friend Lori Sullivan, here she is with a nice Petite Cascapedia Salmon. Nice one Lori! The Bonaventure went 5 cubic meters per second to 7 and Petite Cascapedia from 4 to 6 . The Grand Cascapedia received a good amount of rain as well , water levels are good with temperatures is in the 50 to 55 degree range and flowing at 11 per second from 7. This was John McGonagle’s first trip to Camp Bonaventure, but not his last, see you next year John! Nice salmon! Some beats fished well while others weren't as productive. A good number of nice salmon were landed along with a good number of grilse. Cooler water conditions combined with big tides should be bringing a run of fish in this weekend and next week. 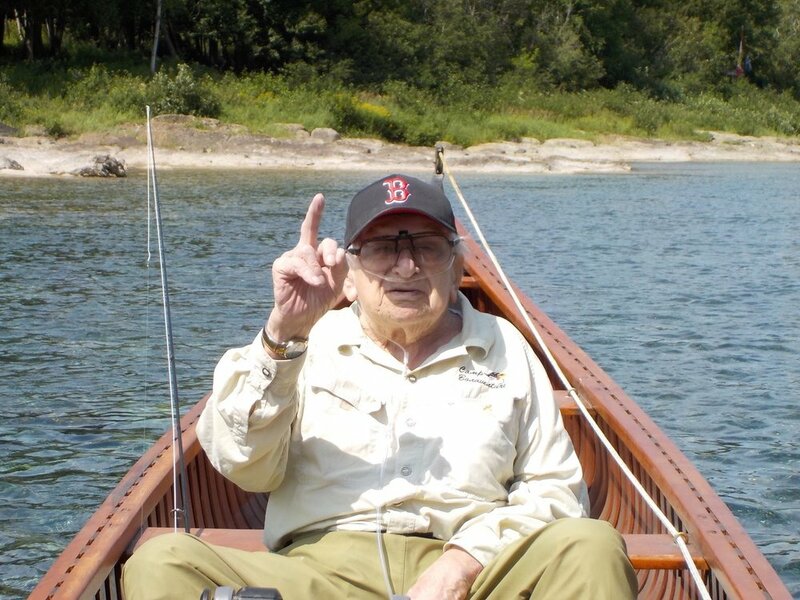 Jean Charbonneau has been coming to Camp Bonaventure for many years, he’s a good friend and great angler. Congratulations Jean! This week hot fly's have been the Red Francis, Sun Ray Shadow and Silver Rat . The Ally shrimp along with the John Olin were responsible for a few more. Dry's are still working well, especially the Blue and Dark Brown Bomber. 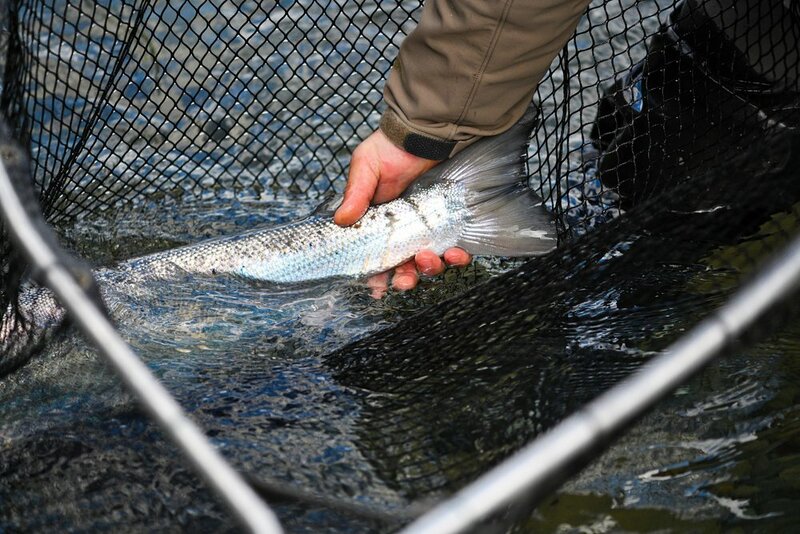 As long as our water temperatures remain in the 50 plus degree range, dry's will continue to be productive. 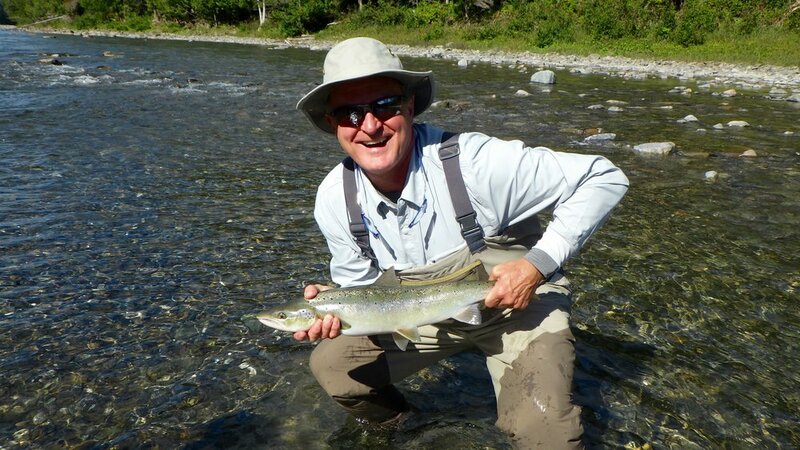 Simon Davies from the UK with his first salmon from this side of the pond, well done Simon! It's hard to believe that August has already come and gone. Camp Bonaventure regular Peter Fraser with his first one of trip, well done Peter, congratulations! Joanna Fraser with a fine Bonaventure salmon, nice one Joanna, well done! The last week of August brought us a mixed bag of weather, hot and humid at the beginning and a little cooler with rain towards the end. Up until this week we’ve been experiencing one of the hottest and driest summers on record . The fishing was a little tougher early in the week but picked up after the rain, overall we still did OK.
James Palmer has been coming to Camp Bonaventure for many years, even in tough conditions Jim knows how to get it done. congradulations Jim! The Bonaventure is flowing at 8 cubic meters per second but still relatively cool in the 60 degrees range and even cooler in the upper sections. The Petite Cascapedia is also low and running at 7 cubic meters per second, like the Bonaventure its still cool. The Grand Cascapedia was down to 9 cubic meters per second but the rain bumped it up to 12 . This was Andre Lavoie's first trip to Camp Bonaventure, nice one Andre! A new moon on August 26th and higher tides brought in a number of fresh salmon and grilse. The much need rain will hopefully entice our fall run of salmon, we’re already beginning to see a few fresh silver fish in our lower pools. Joseph Anscher with his first Bonaventure salmon , nicely done Joseph, see you next year! As our water levels fall and start to get a little cooler we`re beginning to use our fall patterns. Even though regulars such as the Stone Ghost, John Olin and Green Machines working well, bigger tubes and Francis patterns are beginning to produce. Dry's continue to take most of fish especially the Dark Brown, Blue and Green Bombers. As long as our water stays above 50 degrees there’s no reason to put the bombers away. Don Grossett has been part of Camp Bonaventure since the beginning, he's not only one of our best friends he 'sa part of our family. It didn't take him long to catch his first one of the season, congratulations Don! Don with a nice fresh run grilse, well done Don! Teo Panzer, with a beauty from the Bony, well done little man! Like his father Pancho, Teo is a great angler. Our dear friend Phil Cattleman at 90 years young! Phil landed an nice fish but we didn't get a photo. He's booked back next year and we'll the camera ready!. Congratulations Phil, see you in 2019. Joel Castleman like his father Phill and brother David are some of our best friends at Camp. Nice on Joel! It Didn't take David long to get on the board, nice start David, well done! Albert Smith with his first Bonaventure salmon, nicely done Albert, congratulations. We Finally received a bit of rain, not the 25 to 30 mm they were announcing but just enough to freshen up our rivers and keep us going for another week. We're supposed to get more next week but not what we are hoping for. Temperatures are supposed to cool down in the coming days, it will nice to get a break from the heat. 2018 has been the hottest and driest summer for the past 60 years. John Rocha, is a Camp Bonaventure regular and good friend. Nice one John, congratulations! The water levels are low on all our rivers but we still have plenty of salmon in our pools. 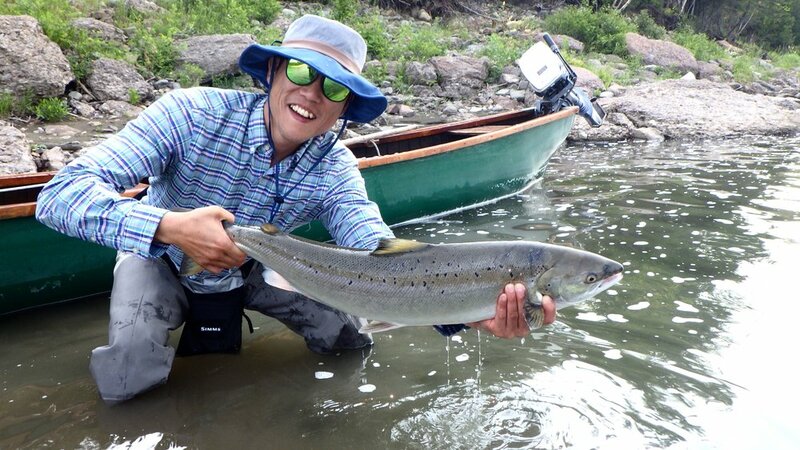 The Bonaventure, Petite and Grand Cascapedia all have good runs of fish and there are plenty just waiting to enter the river on the next bump in water. All the rivers on the Peninsula are low at the moment but very fishable. We are fortunate that our rivers run cold from the Chic-Choc mountains and remain cool even when the weather warms up. 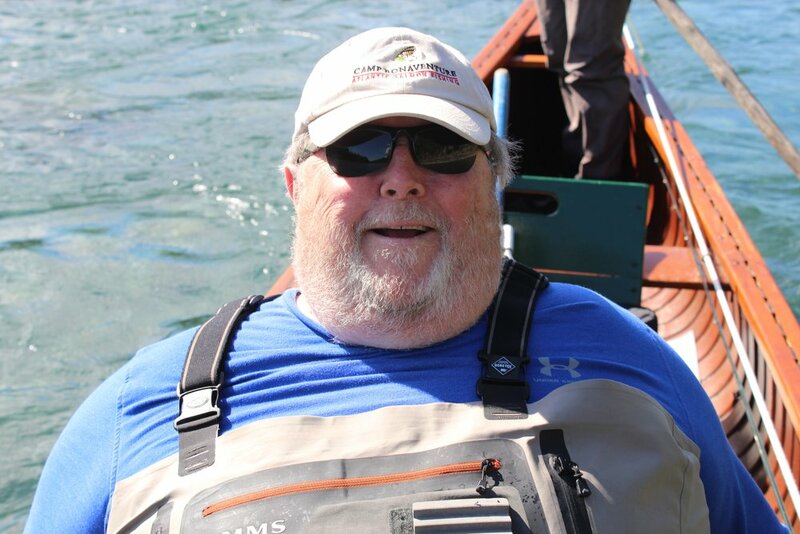 Tim Ingram has become a good friend to us over the years, a fine gentleman and wonderful angler, nice one Tim! The Bonaventure is flowing at 7 Cubic meter per second, it should be in the 20 range at this time of the season. The Petite Cascapedia is flowing at 6 cubic meters per second, for this time of the season 20 is the norm. The Grand Cascapedia is flowing at 12 cubic meters, normal for the mid August is 25. Don Grosset has been part of Camp Bonaventure since day one. here is is playing salmon no. 3 in as many days, well done Don! Tom Stoker sure knows how to get it done, good start Tom, see you next year! Small flys have been working the best, in particular the Undertaker, John Olin and Green machine in sizes 8, 10 and 12. We are still doing very well on bombers especially the Green, Dark Brown and Blue. John Lowery (right) and Chris Davis have been part of Camp Bonaventure for many years. Not only great anglers and good friends, they were high rods for the week with over ten landed in four days! way to go guys! Celebratory fist bumps and back at it! 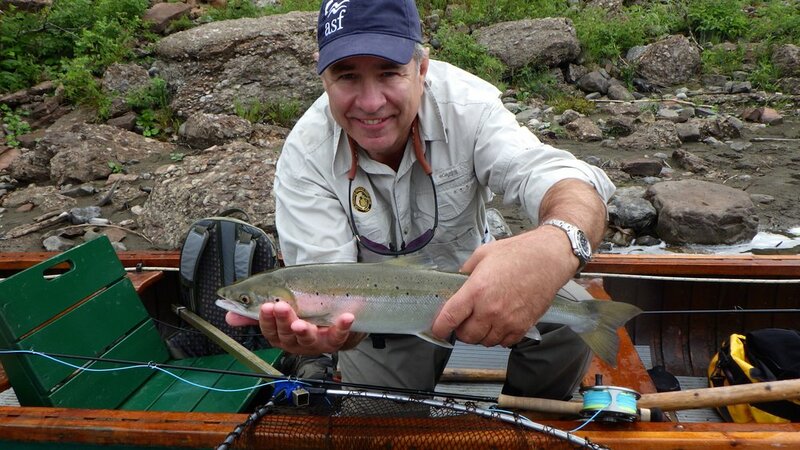 John Lowery releases a nice on back on the Bonaventure, congratulations, John! The water might be low, but we're not missing salmon! ASF's Kirsten Rousse with her first one of the season on the Petite Cascapedia, congratulations Kirsten! 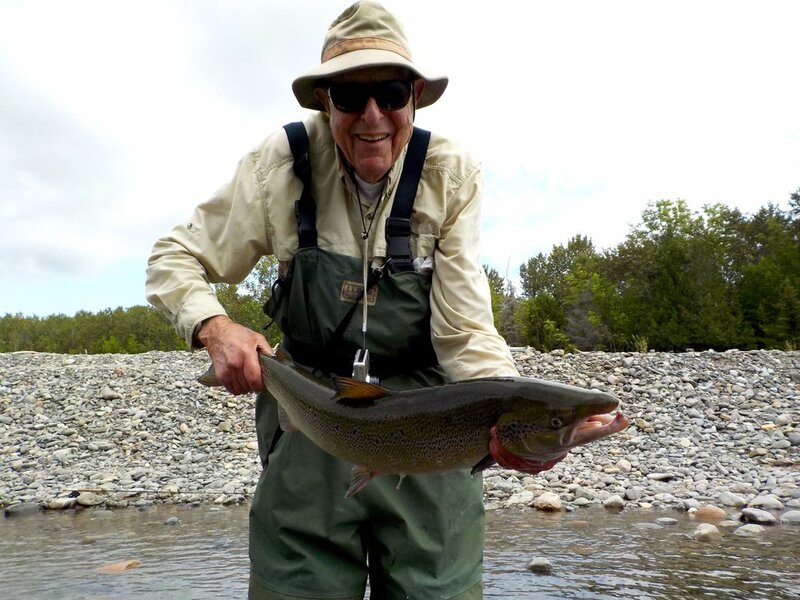 Camp Bonaventure regular Keith Williams with a nice salmon from the Bonaventure. Well done Keith, see you next year. 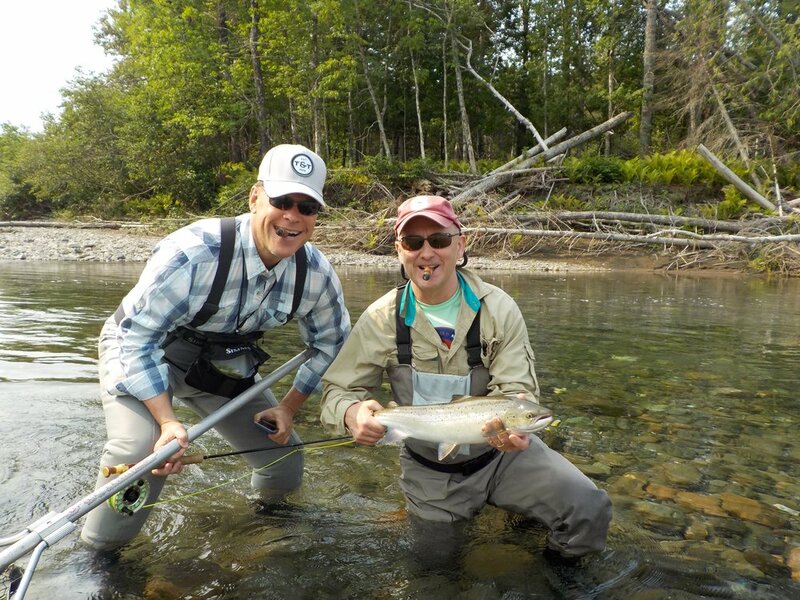 Tim McDonald(Right) landed his first Bonaventure salmon with Camp Bonaventure master guide Marc Poirier. Well done guys. Stephen Lloyd puts one back on the Bonaventure, Congratulations Steven! James French with his first one of the season, nicely done James! They may have been harder to catch in the warmer weather, but its not because they weren't there! Last weeks fishing was controlled by the weather, some days were rainy while others were hot and sunny. The high tides associated with the full moon brought in a nice run of July salmon and grilse. It seems we're running about two weeks behind schedule this season. Our lower pools are holding fresh salmon, however water conditions remain very low. 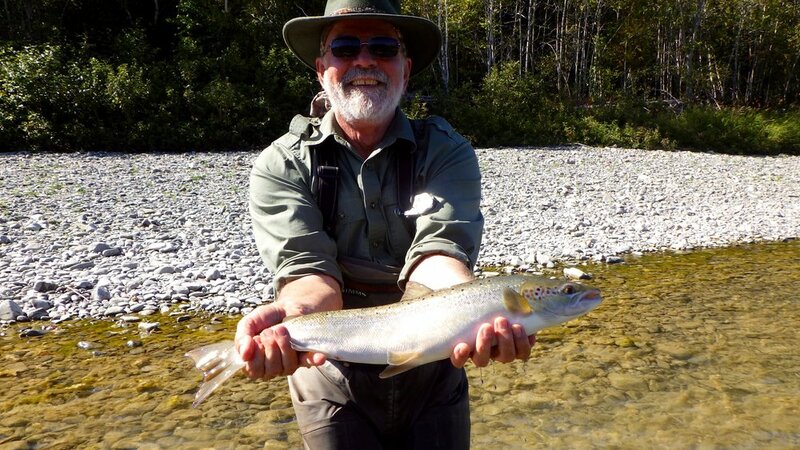 Camp Bonaventure regular Marc Andre Bourdon landed this fine salmon on the Bonaventure, Nicely done Marc Andre! The Bonaventure's flowing at 11 cubic meters per second, about half the volume for this time of the season and water temperatures are in the 60 degree range The Petite Cascapedia is flowing at 8 , very low but still fishing well. 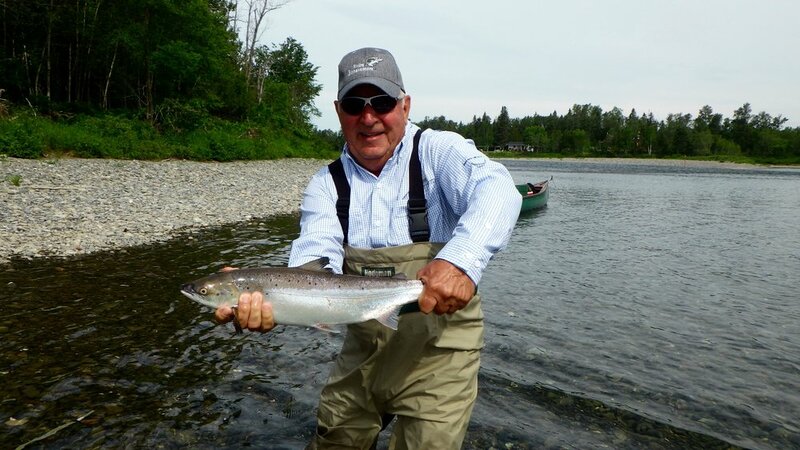 The Petite saw a nice run of fresh salmon during the high July tides and most pools on the Petite are holding fish. 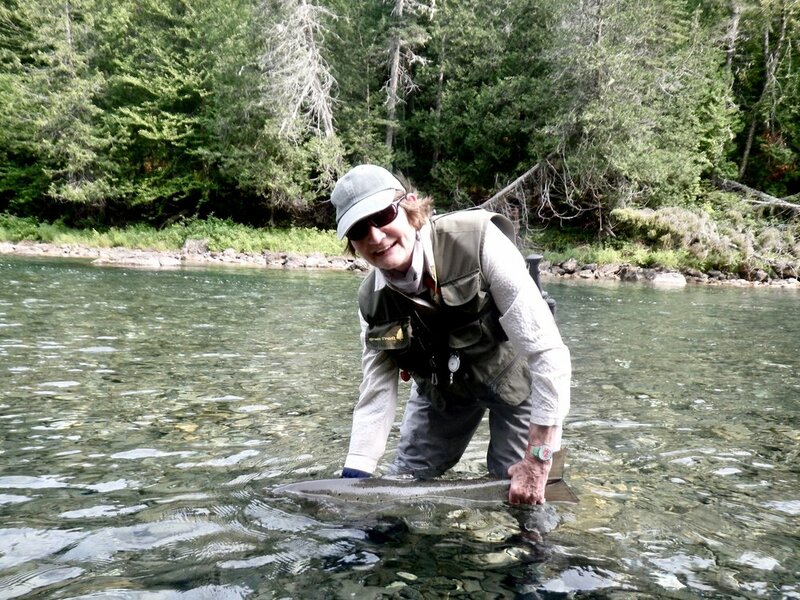 David Hill with Camp Bonaventure master guide carol Barriault, congradulations David on your first Bonaventure salmon! Fishing on the Grand Cascapedia continues the been just OK. The flow rate is at 13 about half of what it should be at this time of the season. We did receive a nice rise in water this past Wednesday but with temperatures in the 80's if fell quickly. Flies of choice are a mixed bag, wets, dry’s and small tubes are all working well. Free floating dry’s have been responsible for most of the catches this week. Forest Green, Dark Brown and Blue Bombers in sizes 4 and 6 are working the best. In the wet fly department, the Silver Rat, Undertaker, Blue Charm andGreen Machine have been doing very well. 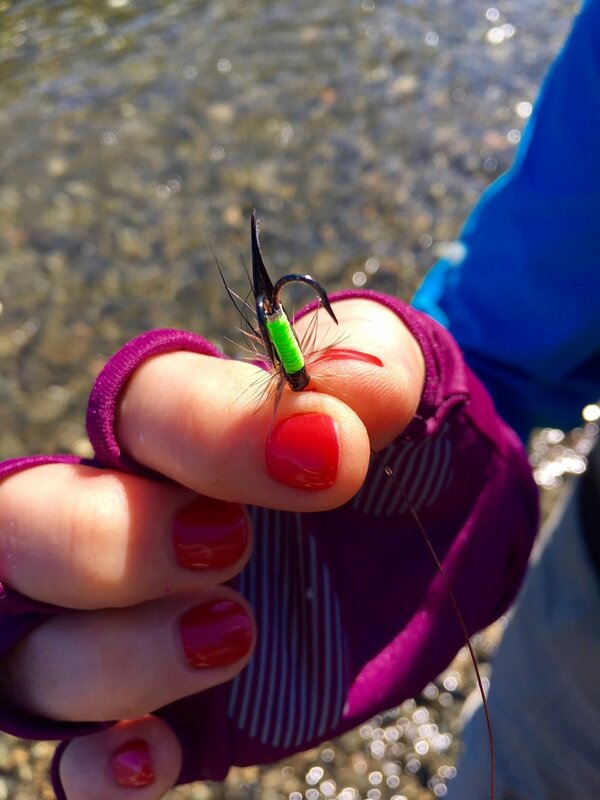 Wet fly sizes in 8, 10 and 12 are the best choice. Isabelle Jewell has been coming to Camp Bonaventure for many years, she not only a good friend but a fine angler, congratulations Isabelle! The weatherman is calling for a mixed bag for the upcoming week, with temperatures in the 75 degree range. no major rain in the forecast. Staying cool, not only us anglers need shade this year! Jeff Sullivan has been a regular at Camp Bonaventure for over 20 years, he's a great friend and an awesome angler, nice one Jeff! Fred Benere has been part of Camp Bonaventure since day one. He sure knows how to catch them, congratulations Fred, see you in September! Pascale Simon with her first one of the season, well done Pascale! see you next year. Jacqueline O'Kelley and Camp Bonaventure master guide Carol Barriault with a fresh run Bonaventure salmon, congratulations Jacqueline! Camp Bonaventure regular Serge Gagne sure know how to catch them, Nice one on our Poirier pool Serge! Martin Weaver comes all the way to Camp from Argentina each year, a great guy and master angler, nice start to the week Martin!!! congratulations. Overall we've had another good week at camp with fish in the book every day. Not the numbers we're used to at this time of the season but fishing is improving with each passing day. Tom Harkness (right) has been a regular at Camp Bonaventure for over 20 years, he's a great friend to us all. 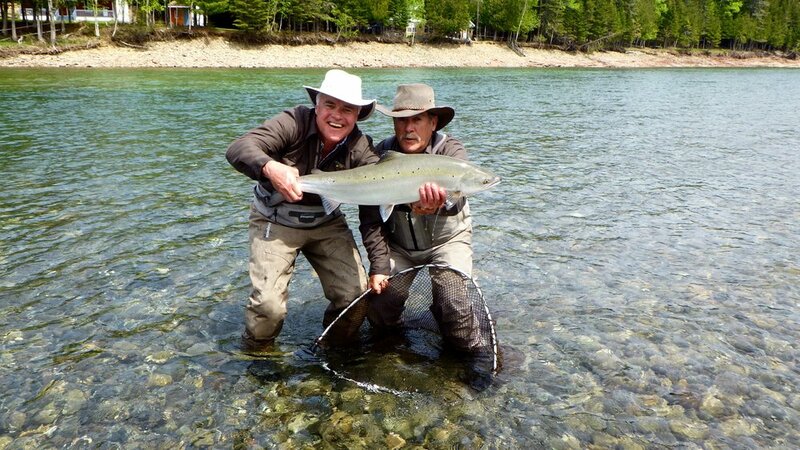 Here's Tom with master guide Marc Poirier with a fine Bonaventure salmon, well done guys! The weather warmed up considerably by mid week and the last few days have been hot and sunny with temperatures in the 90 degree range. Mornings and evenings are the time to fish when it gets this hot. 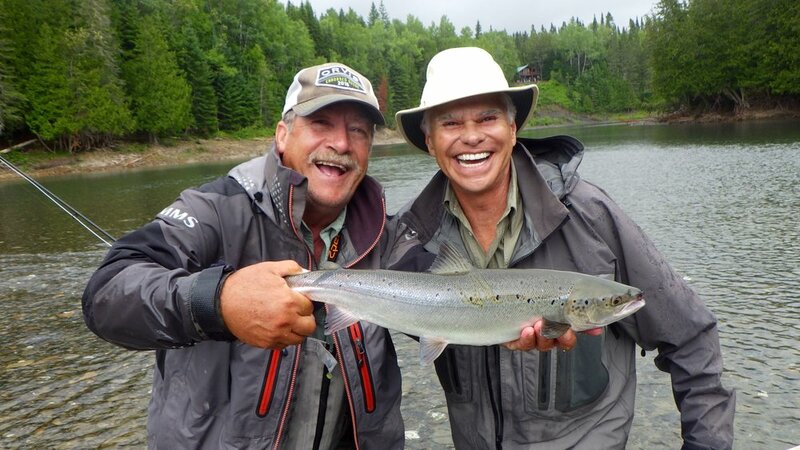 Gianni Marostica (Left) with our head guide Mario Poirier, Gianni's a great angler and a good friend. Congratulations Gianni! The Bonaventure continues to produce some nice salmon and our water temperatures are staying cool despite the hot weather. The rain we received late last week maintained our water levels and gave the bony a nice boost. Water flow on Saturday was 30 Cubic meters per second, perfect for this time of July.. This was Anna Beatrice's second time to Camp Bonaventure, she 's quickly becoming a pro, nice one Anna, see you next year! The Petite Cadcapedia is also producing some nice salmon and our guides are telling me there are fresh salmon in most pools. Water flow on the Petite is at 15, she definatly could use some rain. The Grand is also fishing well but could use a couple of rain to bump water levels. Water flow on the Grand Cascapedia is at 22, below normal for this time of the season. Tom Kazenback had a great week's fishing , congratulations Tom see you again next year. Tom Smith with a fine salmon from the Petite Cascapedia, nice one Tom, well done. Long time Camp Bonaventure regular's Pierre Vezina and his wife Diane, A nice salmon from the Grand Cascapedia, nice one! Patrice Vezina puts this nice one back to swim another day, congratulations Pat! see you in September. The weather man shows a bit a rain early next week and temperatures will be cooling down . Maybe this hot weather will produce a thunderstorm, we are keeping our fingers crossed. Our 2018 salmon season is officially open! and as usual we`re getting anxious to see what this season will bring. Each year's different and we're always hopeful for of great season with plenty of salmon. This winter was a cold one with plenty of snow and seem to last forever. Spring was cool and wet putting us about two weeks behind schedule. Our rivers typically get their first Salmon between the last week of May and first week of June. With the later than normal spring the first fish are just beginning to show up this week. Despite the late spring the Bonaventure is in great condition. Our first guests arrived on May 29th for a couple of days Spey Casting lessons with Neil Holding. They were in fine form for opening day. Poirier Pool is always on of the best nearly season. On June 3rd we were joined by eight wonderful ladies from Montreal. All beginners and all eager to learn the art of fly casting and angling for Atlantic salmon. All dressed and ready to go, what a great group of ladies! 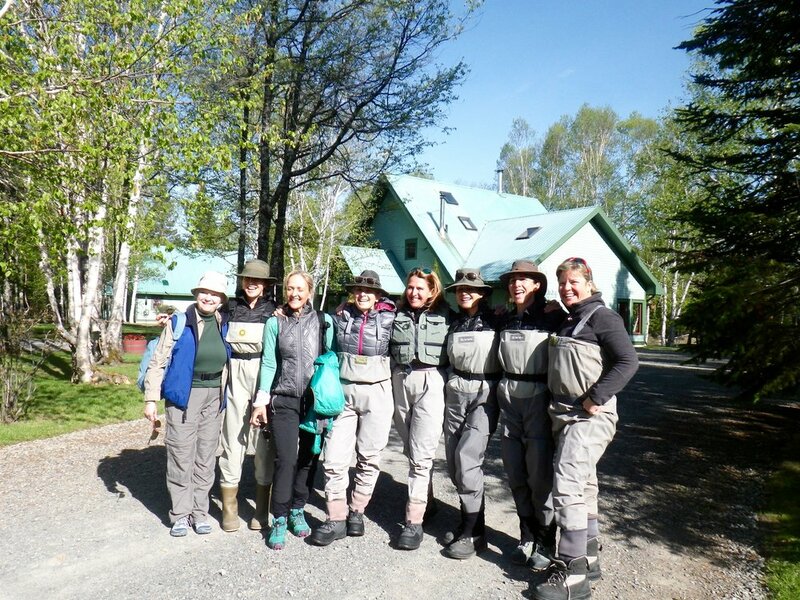 Our guides were all gear up and eager to teach and after a few days on the river, everybody was having a wonderful time. Casting was great but unfortunately the catching wasn’t. 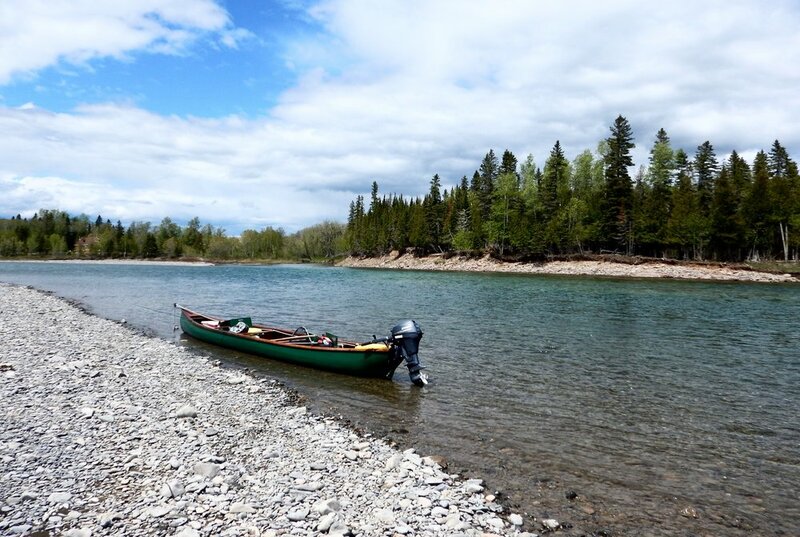 A couple of our guides reported seeing a few fish here and there but nothing to get excited about yet. Spey casting 101 and doing great! 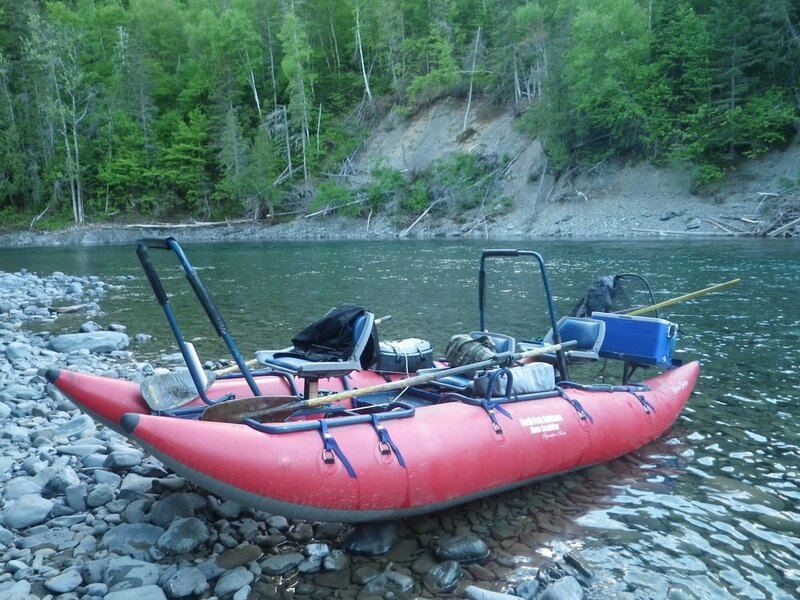 The latest we have ever gone at Camp without catching salmon is June 7th. 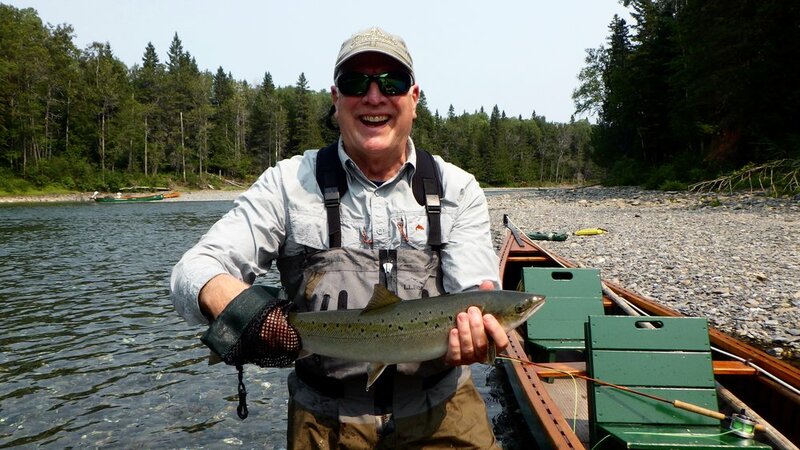 It looked like we were going to set a new record but thanks to Camp Bonaventure regular, John Frost from Denmark and our master guide John Law, a fine 12 pounder went into the books, June 7th. John Frost with Camp Bonaventure guide John Law with the first salmon of the new season, congratulations John! well done. Water condition are perfect for this time of the season, clear and running cool. The weather man is calling for a few showers by mid week and cool whether which should maintain water levels. The Bonaventure is flowing at 75 cubic meters per second, The Grand Cascapedia at 95 and the Petite Cascapedia at 50. 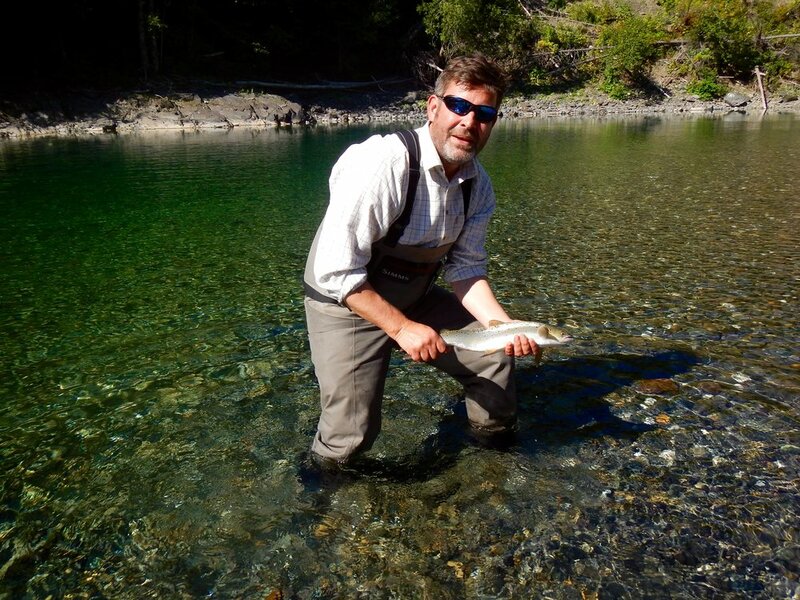 The Bonaventure is just starting to see its first salmon. A couple of big fish we holding in Poirier pool on Saturday , but wouldn’t take a fly. The Grand is beginning to produce and a coule of nice fish have been landed. You’ll have to wait until next week for the Petite, it opens on Friday the 15th. The first week is always a bit exciting, everyone is looking for that first big fish of the season. This time of year, we are fishing our high-water pools from top to bottom, you just never know where a fresh salmon will be holding. With one fish in the book for the week the hot fly was John Frosts Naglie. I’m sure next weeks fly choice will be a little more elaborate.